Isomate LBAM Plus excels as an integrated treatment against lightbrown apple moth (Epiphyas postvittana) populations. In Australia, Isomate LBAM Plus is registered for use on apples and grapes. Use as a powerful mating disruption tool in combination with a reduced insecticide program where populations are high or resistant to insecticides. Isomate LBAM Plus is completely harmless to non-target insects meaning more beneficials for the control of mites, aphids and other pests. 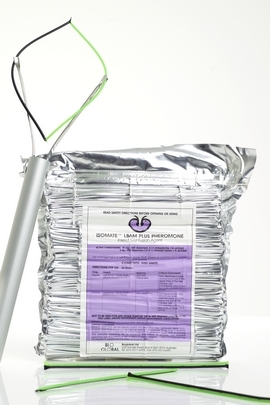 Isomate LBAM Plus allows growers to produce premium quality fruit with little or no insecticide after petal fall. Fluoro fade-strap to indicate age and improve visibility in trees. Added UV protection for better control. Strap feature to allow easier application to trees – no more twisting! 500 dispensers per pack for easier calculation.